First Baptist Church Hamilton member Mike Brudzinski has been presented with a Distinguished Scholar Award for 2019 as a faculty member at Miami University in Oxford, Ohio for excellence in research and activity in seismology. Mike was nominated for his work along the Pacific Northwest and along the Pacific coast of Mexico — research that provides insight into the physical process controlling the occurrence of slow-slip and seismic tremor in relation to the "mega-thrust" of earthquakes that cause life-threatening incidents such as tsunamis. "His research on this topic has resulted in the development of meaningful governmental regulations related to induced seismicity in Ohio and in other states that have undoubtedly decreased the number and magnitude of induced earthquakes," the University said a nominator stated about Mike. Mike is a professor in the geology department at the college. He has a B.S. in physics and marine geophysics and a Ph.D. in geophysics. Mike attends FBCH with his wife, Erica, and two daughters, Anna and Lauren. Read Miami University's full announcement here. Moms in need of 'me time' find it with these groups . Moms of secondary students and young children are the last to have a lot of time for relaxing and fellowship. With that in mind, First Baptist Church Hamilton is offering just that: Any mother with kids — newborns through age 18 — is invited to join MOPS and MOMSnext to get some "me time" in, with Jesus at the forefront. The third Tuesday of each month is a time for mothers to come together for breakfast, crafts, a Bible devotion and to hear from a guest speaker. The MOPS and MOMSnext groups meet at 9:45 a.m. until 11:45 a.m. at the church, 1501 Pyramid Hill Blvd. People who attend do not need to be members of FBC Hamilton, and childcare is provided free of charge. There is another Bible Study opportunity for mothers of children at 9:45 a.m. on the second Tuesday of the month. MOPS and MOMSnext co-chair Julie Yantes says there is also child care provided for that. On the fourth Tuesday of each month, members of the groups are invited to meet up with their children for play date, Yantes said. "We do Jump'N Jacks, or go to the library, or just play in the gym at church," she said of some of the play date activities. The mother-focused groups also meet on Wednesday nights while their children attend the various Christ-centered programs for youth at FBC Hamilton. And there are sometimes meet ups on Friday nights — those are without children to allow moms to re-energize and get some more of that important "me time." Yantes says at the monthly meetings, moms "are able to have actual conversations and eat our food and drink our coffee while it is still warm. We go through a lot, and it's nice to be able to find other moms who are going through the same things we are." People who are interested in more information on MOPS and MOMSnext at First Baptist Church Hamilton should visit firstbaptisthamilton.org/mops. "It is a lot of fun and it's great to be able to count on these relationships with other moms," Yantes said. "It's nice to be able to have someone to talk to who is going through the same things you are. We also do so much outside of MOPS as a group." Women with children gather on a night out as part of MOPS and MOMSnext at First Baptist Church Hamilton. First Baptist Church Hamilton is currently in a Sunday series of sermons regarding the modern family. What does your family look like? What does it mean to be a "typical" family? A "modern" family? Statista.com says a typical American family has three people on average. The number of family households with children younger than 18 has decreased over the years, which shows a decline in the birth rate. That maybe even shows decline in the economic conditions of the U.S., Statista states. The average family (three people) has a median annual income of $72,707. In 2018, there were about 61.24 million married couples living in the United States, according to Statista. 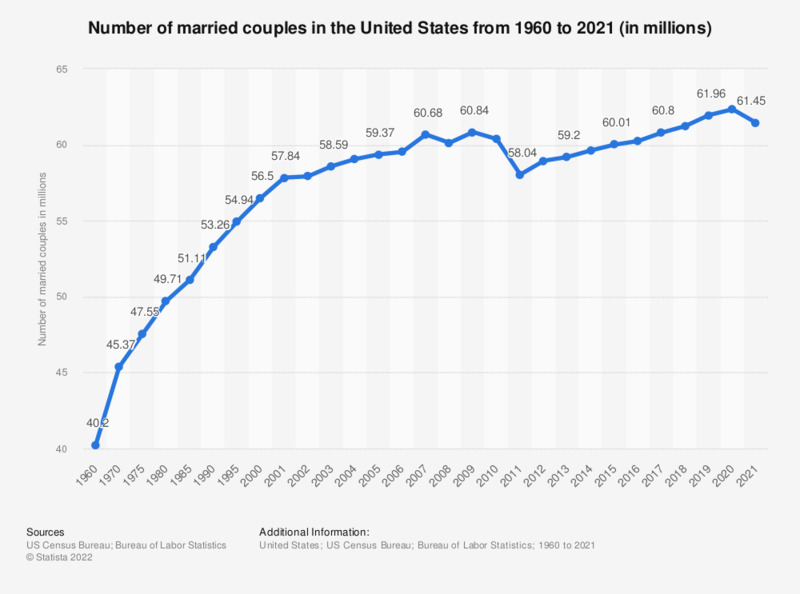 In 1960, there were only 40.2 million married couples living in the U.S. But population growth means this is still a decline. "The rate of marriage has decreased from 9.8 per 1,000 of the population in 1990 to 6.9 per 1,000 of the population in 2017," Statista says in its married couple report. At last count, the divorce rate stood at 2.9 per 1,000 (in 2017). In 1992 that was 4.9 per 1,000. But the divorce rate is different: It's lower because of fewer folks getting married. Decrease marriages, decrease divorce. Millennials are less likely to get married, which will keep the marriage rate on the decline. One of the reasons for fewer marriages among millennials? With this information in mind, let's look at the demographics of Christianity. In 1948, at least 69 percent of U.S. residents identified as Protestant. In 2018, that number has dramatically decreased to just 35 percent. The U.S. has seen a significant decline in the number of Christians, and thus a decline in the number of people following God's call for marriage and family. The landscape of relationships in America has shifted. According to the Pew Research Center, Americans are simply staying single longer — the median first-marriage age is 30 for men and 28 for women as of 2018 (a U.S. Census Bureau statistic). But youth is not the most affected group here: Divorce rates have soared among those 50 and older. For every 1,000 older adults, 10 are divorced (that's up from five in 1990). And among those 65 and older, the divorce rate has tripled since 1990. The good news? Love stays at the top of the list of why Americans get married, according to Pew Research. It's not money, and it's not desperation. It's love! In fact, 9 in 10 Americans list it as their reason for marriage. It's ahead of companionship, financial stability and legal rights. That is something to celebrate! Want to read what the Bible says about divorce? Here are some helpful passages. Comedian John Crist performs at Taft Theatre in Cincinnati on Feb. 28, 2019. "Christians, can we not be so uptight? Read the end of the book. We already won." That's how Crist justifies finding humor in everything: As Christians we should feel safe knowing the finality of our physical lives will be met with an eternity in Heaven. What a great comfort! Patience: It is about feeling safe. We want to be dwelling in the Lord and filled with His peace. When we seek to be patient, we push aside the idea of easy promises: Patiently listening and waiting on His guidance is key to a healthy faith and relationship with God. The world offers false hope. Christians must be smart enough to recognize it. In that moment of recognition is when the peace that passes understanding will be present. Patient people know to rise above the chaos or struggle. Understanding how to have patience is key to stress management and can help keep our relationships from tearing apart. Stop and think about things when you become impatient. Are you late to work and traffic has you stopped? Is someone talking too much and your mind is wandering? Maybe you are hungry? Dehydrated? Look for the solutions to the problem, and if there is no immediate solution ... take a deep breath. Pray. Control your thoughts. You will get through it. Something else that pushes patience farther away: You must remember you cannot control people. If someone is doing something embarrassing or discouraging, are you feeling like it reflects on you? Think from outside of the situation: Are people looking at you? Or is it on that other person? Again, pray it out. Do some deep breathing. Practice mindfulness to force the impatience out of your mind. "Let the peace of Christ rule in your hearts, since as members of one body you were called to peace. Be thankful." Part of John 15 says, "Every branch in me that does not bear fruit He takes away, and every branch that does bear fruit He prunes, that it may bear more fruit. Already you are clean because of the word that I have spoken to you." A branch can't bear fruit on its own ... it needs the vine. God is the vine and we are the branches: Both work together for good. Without one, the other cannot grow. In John 15:16, the Lord says He chose you. You did not choose Him. You have been appointed to bear fruit. Our lives as Christians are His doing, and we are blessed to be chosen. This is a big choice as those who are called are to serve in His name and bring others to Christ. While you choose to accept Christ into your heart, He called you by name. Ash Wednesday is set for March 6. That marks the beginning of Lent: A time of repentance and fasting. These actions are in preparation for Easter and allow us to go through some self-examination and reflection. "In the early church, Lent was a time to prepare new converts for baptism. Today, Christians focus their relationships on God, often choosing to give up something or to volunteer and give of themselves to others," Pastor Dan Clemens writes in the Courier, a newsletter of First Baptist Church Hamilton. Pastor Dan writes: "May we commit this time to prepare for Easter, may our fast be to selfishness and giving more of ourselves to our primary relationships." Read February's full "Daniel's Den" article here. Have you decided which thing in your life should be a boulder? The boulder is the ONE THING you should focus on for a season. The idea is this: We all do multiple things at the "good" level, but if we put our energy into just one thing, it would be great. Picture yourself throwing a handful of pebbles into a stream. It makes very little impact. But picture throwing a boulder into that stream. There's a ripple effect, and the landscape may even be impacted. It makes much larger movement. Hollis suggests you take one thing you want to do and push all the others aside for one season. Focus only on getting that done. Back up even more and map out how you want to get there: Are you wanting to write a book? Have you been stuck in research phase and never actually started typing? Maybe you are wanting to open a store but don't know where to start. So you just keep the germ of the idea in your head but never move forward. Put aside the other things in your life (learn to say no, even when it's difficult), and focus on the boulder. Make the waves. What's your boulder? What is the biggest project you want to start but because of the other little things in your life, you have not? Maybe you want to go back to school but don't have proper childcare. is it possible to get a better job, that leads to better hours, that leads to easier childcare? How far back in the process do you need to go to set yourself up for throwing that boulder? Write things down. Turn off the devices, get the kids out of the house, put on only music without lyrics and start thinking. Focus. Don't drift: Write it down. Next season, are you able to leave that boulder, and move a new one? Try not to revert to being a pebble thrower unless all the boulders are in the water. It's beginning to look a lot like ... February. And there's a lot of activity happening at First Baptist Church Hamilton. There is a Tuesday morning Bible study for MOPS (Mothers of Preschoolers) from 9:45-11 a.m. Feb. 12 in Room 203 at the church. Childcare is provided. MOPS and MOMSNext have a monthly meeting coming up — 9:45-11:45 a.m. Feb. 19 in Room 200. Childcare is provided then, too. • Kids — Awana, 6-7:30 p.m.
• Youth — First Student Ministries, 6-7:30 p.m.
• Adults — Bible study in Room 200, MOPS in Room 203 and Small Men's Group in the board room, 6:30-7:30 p.m.
Also happening in February is a luncheon for our childcare workers. That's slated for Feb. 24 and we need folks to sign up here. We also have a class for new folks called "belonging." That's on Feb. 10. Get info and sign up here. Need more information? Surf this website or call the church: (513) 868-1412. There's also info on the church's Facebook page.